Carbon Capture and/or a Carbon Tax … Someday Maybe? “Pollution-driven climate change hurts our economy, damages our infrastructure and harms public health,” he told his audience. “However, none of these costs are factored into the price of the coal or oil that’s burned to release this carbon. The big oil and coal companies have offloaded those costs onto society. Whitehouse praised the Obama administration’s limit on carbon emissions from power plants, announced in June, saying “It will change the way polluters think.” But he’d like to take the next step of making polluters pay for their cost to society. He said that not only would it reduce carbon emissions and improve air quality, it would generate significant new revenue for the federal government, perhaps as much as two trillion dollars in the first decade. He pointed to some of the positive uses that money could be applied to, including cutting taxes, relieving student debt, increasing Social Security benefits and providing transition assistance to workers in fossil fuel industries. “Not long ago, Republicans joined Democrats in pushing for action on climate,” Whitehouse said. “Leading Republican voices agreed that the dangers of climate change were real. Leading Republican voices agreed that carbon emissions were the culprit. And leading Republican voices agreed that Congress had the responsibility to act. Then the heartbeat flatlined. Republican calls for climate action fell silent. Washington, D.C. – Today, U.S. Senator Joe Manchin (D-W.Va.) hosted Senator Sheldon Whitehouse (D-RI) in West Virginia to continue their ongoing discussions about finding meaningful solutions to balancing our nation’s energy needs with our environmental concerns. Senator Manchin emphasized the importance of developing new fossil fuel technology to continue producing affordable and reliable electricity, while steadily reducing carbon emissions and addressing the adverse effects of climate change. 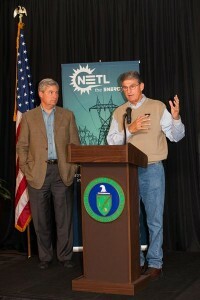 Senator Manchin toured several coastal areas of Rhode Island on October 10. Due to inclement weather, travel restraints required the day’s agenda to be slightly readjusted. Senator Manchin and Senator Whitehouse toured the National Energy Technology Laboratory (NETL) to gather information about the facility’s development of groundbreaking energy projects, including details on how to operationalize carbon capture and storage. Then, they traveled to Longview Power to learn about the advanced technologies at their coal-fired power plant. They also attended a briefing led by officials from Dominion Energy, American Electric Power and FirstEnergy to discuss the utility companies’ actions to produce cleaner power from their coal facilities and the impact stricter environmental regulations have on their ability to ensure reliable and affordable electricity throughout the region and this country. Finally, they met with officials from PJM Interconnection to hear about the importance of reliability to our nation’s electrical grid. Once Congress returns from its recess after the election season, Senators Manchin and Whitehouse will continue to work with the Department of Energy (DOE) to ensure its available $8 billion in loan guarantees and $1.7 billion in available advanced fossil grants are used to invest in innovative technologies, including those that capture, utilize, and sequester carbon dioxide.